It seems like everyone in the world has these Saint Laurent studded boots. Well, anyone whose style I’m inspired by has them. Sure, if I could justify spending almost 2,000 on a pair of shoes, they would also be in my closet. Since I can’t, I currently have a stylish knock off pair that was given to me for Christmas. I’m not actually sure why I’m even sharing my boot envy with the world. I’m very appreciative of the gift version, don’t misunderstand. That said, since this is a blog where I get to have both style envy and live a very fashionable existence on virtual paper, I decided to style the actual Saint Laurent boots of my dreams. Both outfits are things I would actually or have actually worn recently with my own boots. What I love most about the boots is the edginess they give a simple outfit. It almost feels like ‘yeah, I could definitely punch someone in the face,’ only I can’t. But the illusion is enough, isn’t it? Posted in Fashion and tagged Fashion, H&M, Polyvore, Saint Laurent, Shopping, Style, Topshop, Women's Apparel on January 6, 2015 by coffeeandwinter. First I’d like to wish a warm welcome to 2015 and say I hope everyone had a lovely holiday. Next, let’s talk about resolutions. There’s not really a firm consensus over whether its good or bad to make resolutions. I prefer to make goals, but unless I write them down I end up forgetting them. That said, one of my major goals continuing into 2015 was to be healthier. I’m definitely not good at this. Sometimes life becomes so stressful the idea of working out or being active just feels even more unappealing. That said, if your resolution is to get healthy and lose weight: great! I prefer to not put my journey that way only because I feel expectations are just so high and feeling like I’ve let myself down is horrendous. Why am I even sharing this? 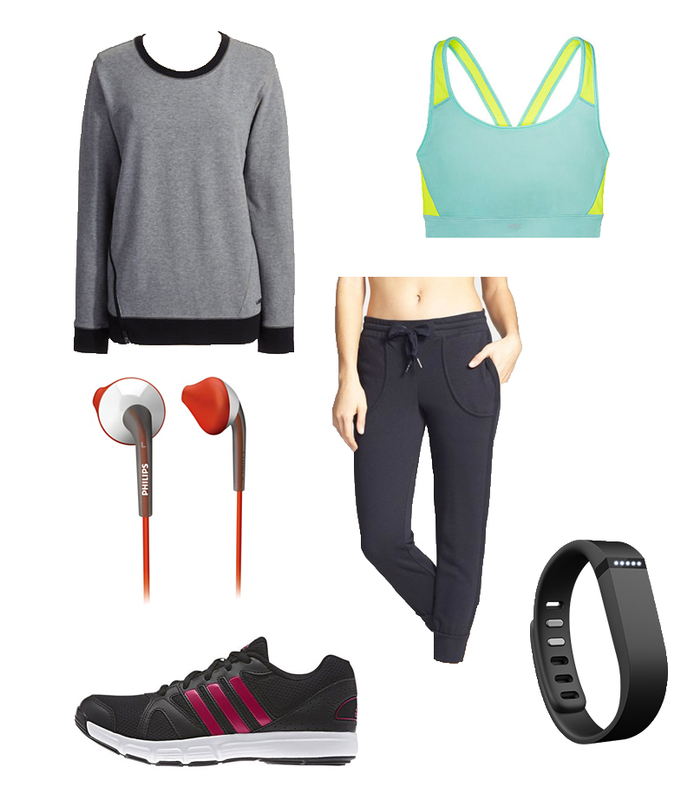 Well, resolving to get active in 2015 means getting to buy a whole new wardrobe of active wear! Active wear has become kind of a really fashionable thing. Yoga pants are everywhere not just yoga studios. While I don’t really understand that (especially to brunch. Everyone knows you didn’t just work out), I’m entirely guilty of wearing them to run out to Starbucks or to the bank. There’s so many options. Long gone are the unitards, off the shoulder sweatshirts, and legwarmers of yesteryear. The best part is it’s all on sale right now for the new year. Old Navy has some particularly good deals if you’re looking for affordable pieces to get started with! 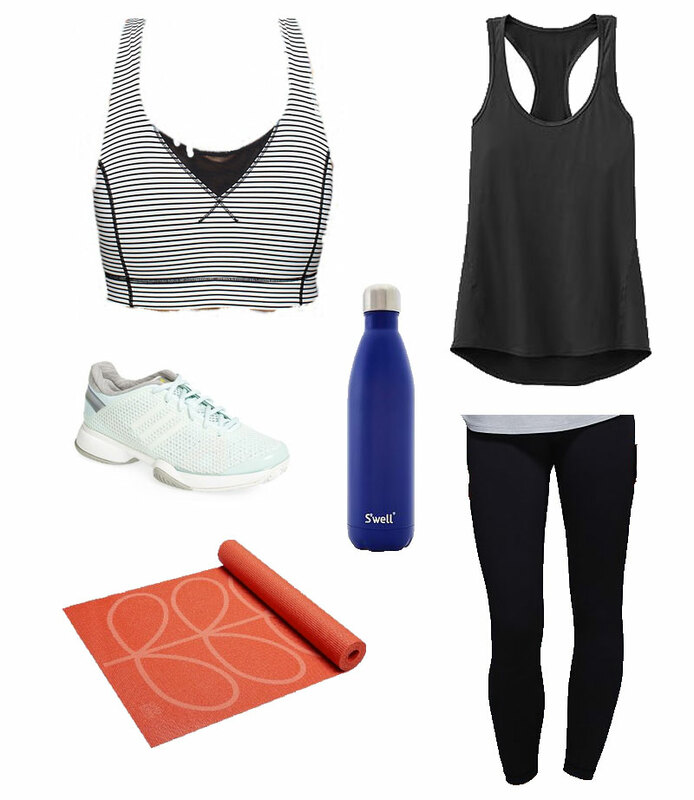 I’ve put together 3 active wear looks featuring some of my favorite companies (Adidas obviously). I’m really obsessed with the Stella McCartney for Adidas range and two of my favorite pieces are included. The yoga mat featured is by Orla Kiely for Target and something I actually use for yoga & pilates. I’m obsessed with it. I’m not sure why it took me so long to actually purchase one. See? I’m no fitness expert! 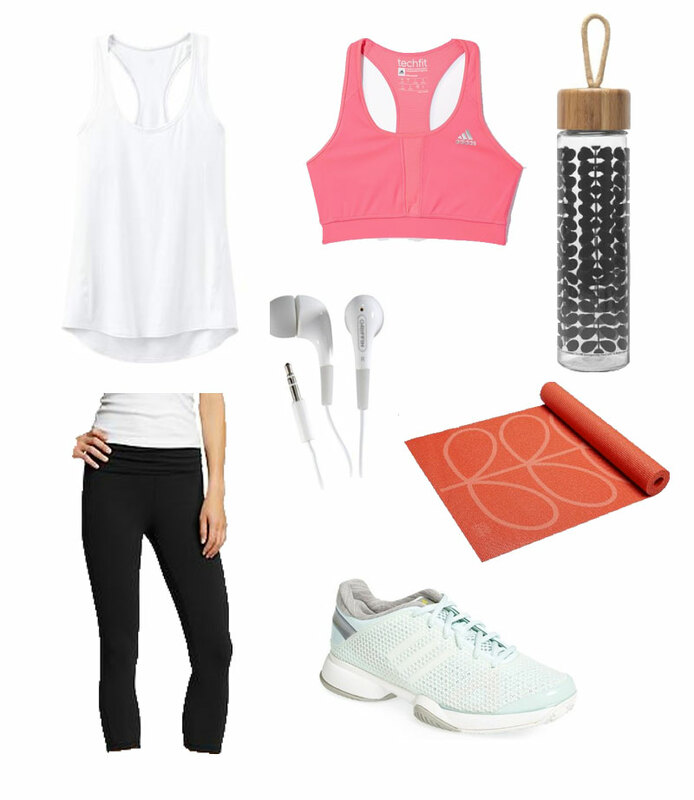 So get out, get active, and look fashionable while doing it! 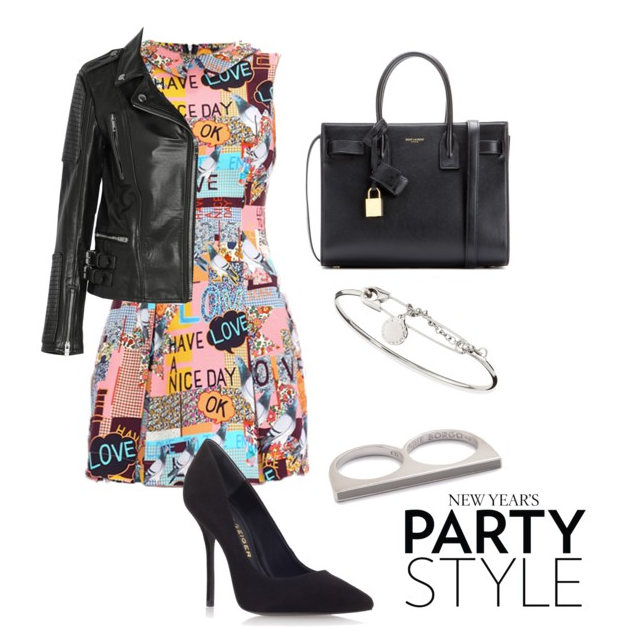 So there’s less than 24 hours until New Years Eve and I have some last minute styling ideas for pretty much any celebration. Sure, it’s a bit last minute and it’s impossible to order these things (maybe technology can work on that), but that won’t stop the inspiration. I’ve styled 3 looks one with a dress (my favorite), one with pants, and one with a playsuit. I have even paired each look with one polish from Essie’s winter collection just to tie everything together. This is my favorite look of the bunch, and I’m not even really a dress person. They just don’t look right with my hips. That said, I would trade in my joggers and jumper for this outfit for any outing tomorrow in a heartbeat. It contains many non-budget friendly items, but again, it’s my dream look so I went big with this one. This is a more relaxed but sparkly look. I would also combine this with a nice peacoat to keep warm. I absolutely love the sparkly top from Topshop despite it being rather out of my comfort zone. Yes, I featured the Eddie Borgo ring & Marc Jacobs bracelet again with this look but simply because I just love them both so much and they seemed to fit well with the color of the Aldo heels. and a white jacket/blazer. The shoes are the real stunner of this look and even then tights may draw more attention to them. Pair with: Jiggle Hi Jiggle Low which seems to no longer be available online so check in stores. 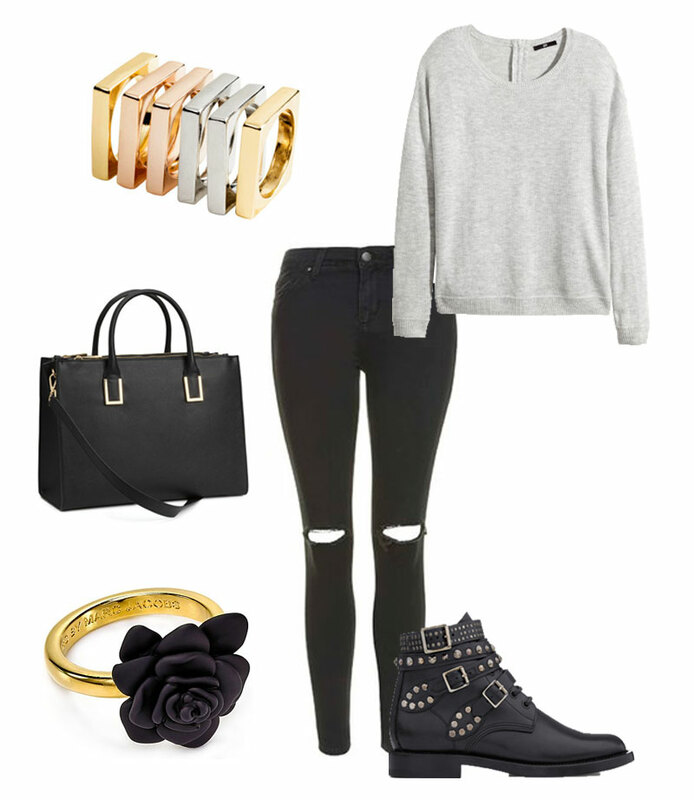 If you feel so inclined follow me on Polyvore! The truth is out: I’m not much of a holiday dress person. I’ve worn them to parties before and just been relatively uncomfortable and fidgity. Let’s be honest, being fidgity looks good on no one. Tonight I’m attending a holiday festivity which is on the more casual side. Well, as casual as wine and cheese can be, and this is the outfit I’m (most likely) choosing to wear. Posted in Fashion and tagged H&M, Holiday: Christmas, OOTD, Shopping, Style, Topshop, Women's Apparel on December 20, 2014 by coffeeandwinter. This year I tried something new and started working out regularly. Not like just taking a walk or parking further on campus, but taking time to physically do something. That seems like not such a big deal but for the last few years I just gave up on it. Making this tiny change required one thing: active wear. I never gave much thought to trainers or workout clothes and even doing so felt so daunting. 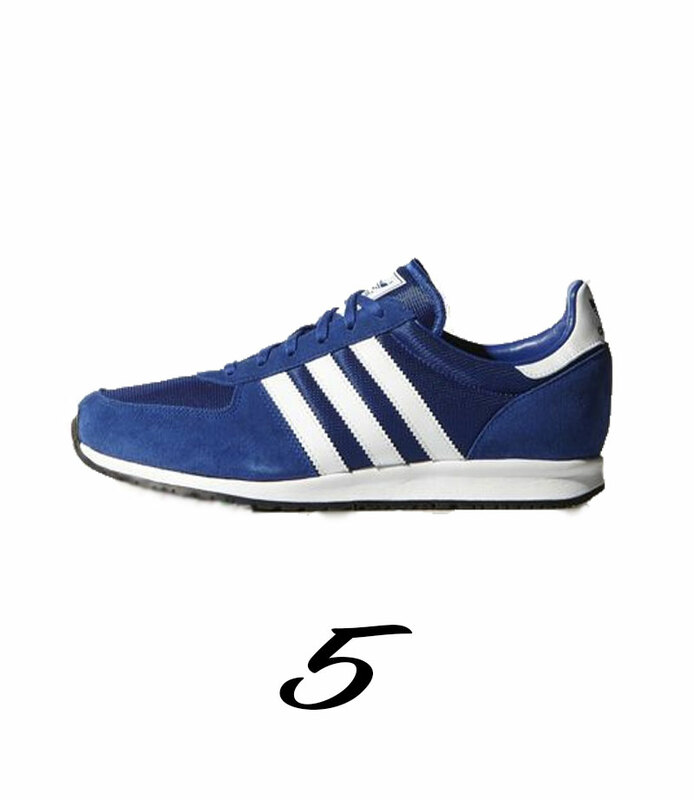 Yes, they are men’s trainers but I loved them so much more than the women’s version so I bought them and really, as far as I know, there’s no style law against it. Posted in Fashion and tagged 12 days of Christmas, Athletic Wear, Gifting, Holiday: Christmas, Shopping, Style on December 19, 2014 by coffeeandwinter. Today’s item was intended to be my one of my favorite clothing purchases of the year: my leather biker jacket. Since I had purchased it many moons ago from H&M, it is no longer available. Rather than share an item no one can buy, should they want to, I decided to browse the jackets/coats and see if anything tickled my fancy. 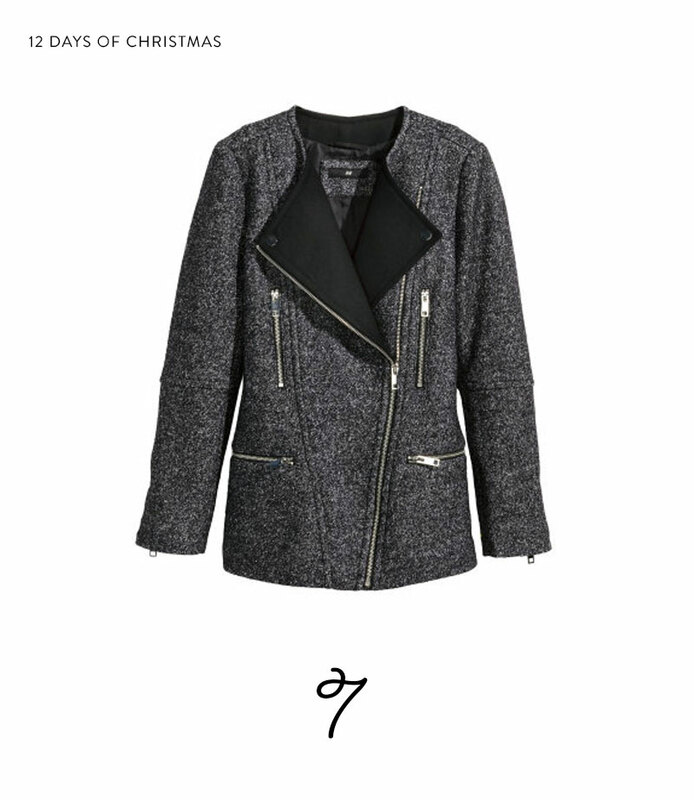 I really liked this wool biker jacket. It seems very warm, stylish, and like the next member adopted into my ever growing closet. I really like the zippers and the jacket flaps. I would probably pair it with a white blouse and a nice pair of jeans for a nice classic, sleek look that doesn’t take away from the coat. H&M does have a couple of leather biker jackets in stock, but none that overwhelmed me. I haven’t been much of a jacket fan since the 90s when I stopped wearing denim jackets. Why should you take my advice then? Well, I’m a reformed jacket lover. I’ve seen the light! Hallelujah! I’ve been missing out on so much all these years. Now I never take my leather jacket off. Just kidding….mostly. I live for blistery days and my beloved coats. Posted in Fashion and tagged 12 days of Christmas, Gifts, H&M, Holiday: Christmas, Recommendation, Shopping, Style, Women's Apparel on December 17, 2014 by coffeeandwinter. After quite the rainy Thursday, it’s a comfortable and overcast Friday. Why all this boring talk about the weather? Mainly because I’m not really sure how to intro a post on my outfit of choice for the day. How does one say…”I, uh, opened my closet and this is what felt right…” and make it worth reading? Needless to say, last weekend I took part in some sale shopping. I finally gave in and got a new bag (seen above) after being ridiculed mercilessly by my bestie for the shear unappealing quality of my old one. It was kind of like that situation where your mom has like a love of all her 80s clothes and just won’t part with them except mine was a bag I bought 3 years ago and won’t get rid of. I also went a bit too crazy on jeans (they were 40% off! ), and even got a cute customizable alphabet necklace (not seen above) from Forever 21. I just couldn’t resist some of the deals at the shops we ventured into, and unfortunately, my wallet was not as excited. Today’s outfit is just a casual but chic look featuring one of my favorite band tees. Yes, I do actually love my mass produced Joy Division shirt even if the likelihood it is also worn by some 15 year old who has never heard their music and just likes the design is fairly high. 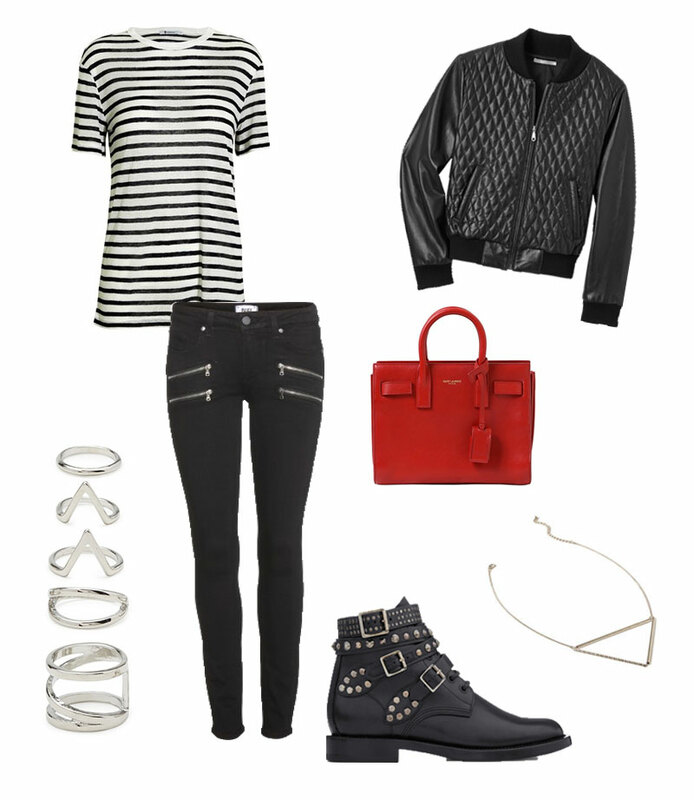 I paired it with my biker jacket and a pair of boots. These boots are much cooler than the boots I actually wore but a girl can dream, right? One may also want to know why I carry a weekender bag with me on the daily. Well, inquisitive individual, on the daily I travel to campus and carry essentially my entire life with me which requires just such a bag so I just stick with it. It’s not ideal all the time since I seem to randomly collect items that stay in there for ages. Oops. One thing I must admit about this bag, I do not like the carry strap. Typically I carry larger bags like this by the strap, and with my school notebooks and such, it just really loves to come unsnapped due to weight. But as long as I’m carrying next to nothing, it’s good to go. Grr. I honestly can’t believe it’s almost November. Sure, there’s still Halloween and a handful of days until November actually arrives, but I must admit I am not entirely prepared for the impending chaos November brings with it. 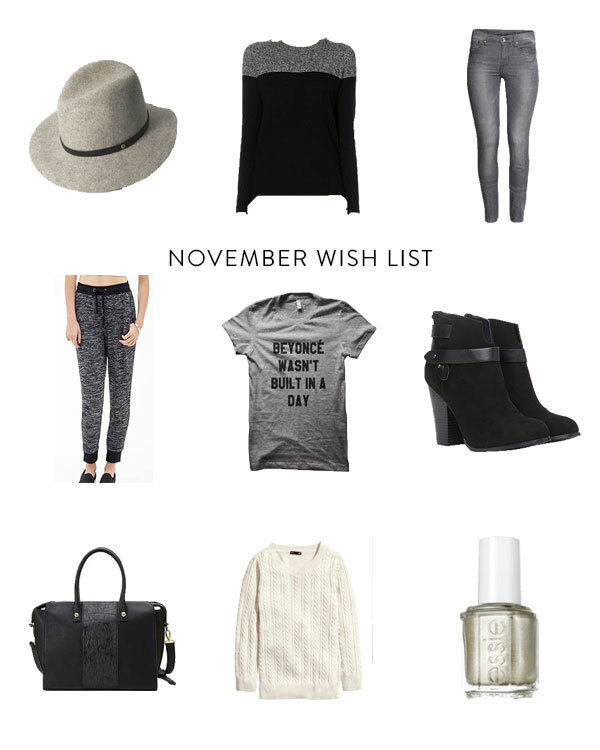 A new month means a whole new wish list of things I want in my closet/make up bag. Here’s my current selections. I absolutely cannot wait for Essie’s winter collection. There are some pretty great colors in there. 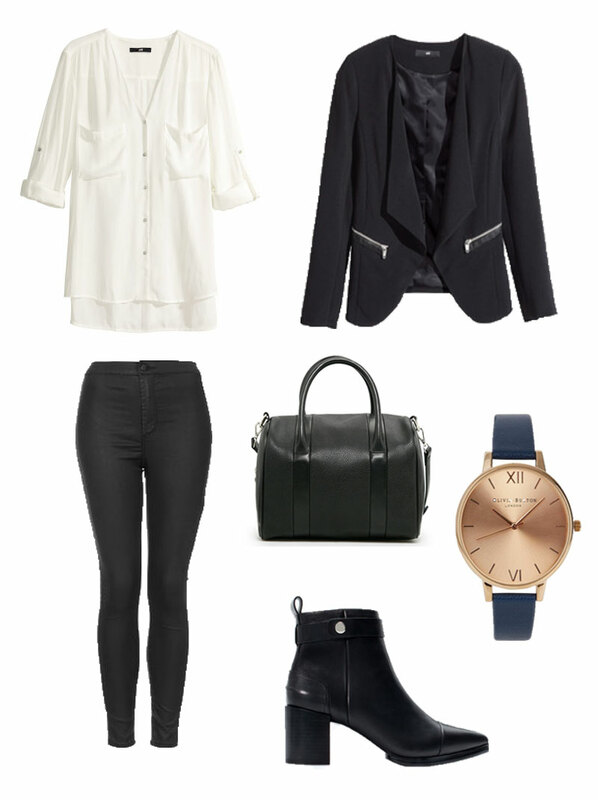 Posted in Fashion and tagged Shopping, Style, Wish List, Women's Apparel on October 27, 2014 by coffeeandwinter. So Halloween is just a week away and it’s time to start seriously considering costume options. I have a couple floating around, both of which I won’t be sharing, but since I’m going to be at a bar for Halloween my costume must be fairly convenient and not at all annoying. I tend to shed most of my costume by hour one. For example, the year I was Wednesday Addams my braids were gone within 15 minutes. So, I’m a bit disappointed I can’t steal one of Grace’s cheap costume ideas, bummer. All of these 5 costumes are fairly simple to put together, somewhat work appropriate (if you are into that sort of thing), and translate well to my plans for Halloween eve. Just, for the love of God, don’t go in a hazmat suit or anything related to Ebola. Have a little taste. Suzy is one of my favorite movie characters and last Halloween I sure did see a bunch of them. That said, I did take this idea from Oh Happy Day’s Hipster Halloween costumes for kids but it translates so well to adult costumes as well. 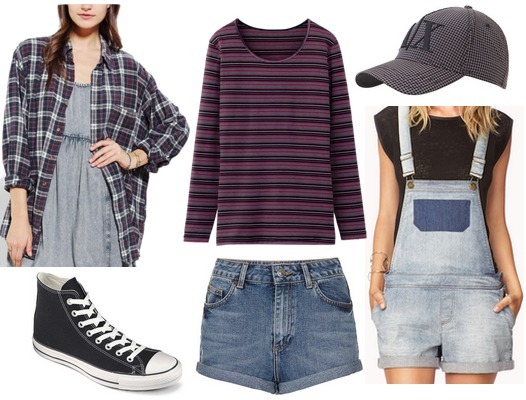 Besides…hipster kid costumes are adorable. 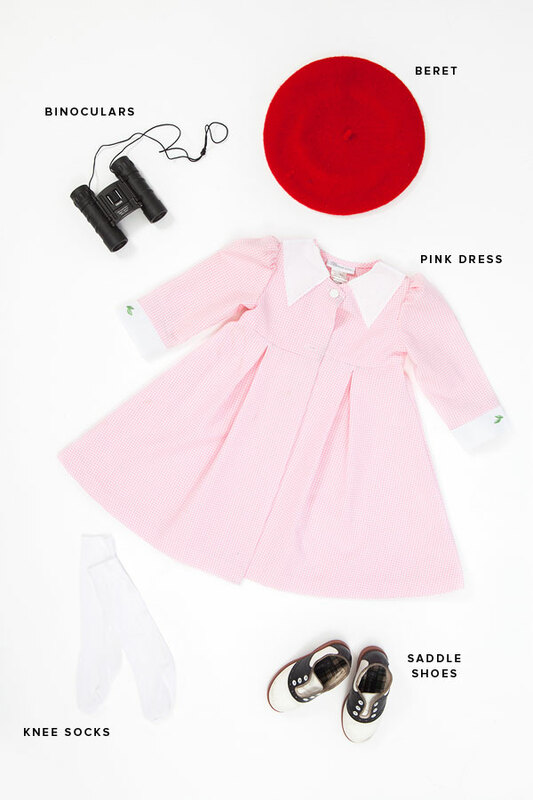 This is such a cute DIY costume from Studio DIY and definitely work appropriate. Posted in Fashion, Inspiration and tagged Costume Ideas, Friday Five, Halloween, Style on October 24, 2014 by coffeeandwinter.